“Not again…” I think to myself every time I change the minimum and maximum values of a chart axis. It’s such a tedious task, and I know I’ll be doing it again at a future point. It only takes a few seconds, but all that time starts to add up. There are various chart objects we can link to worksheet cells; source data, chart titles and data labels can all be linked to cells, but the chart axis is set by hardcoding a number into the Format Axis options window. Well… I’m not so easily defeated. I decided to build a more dynamic solution. I turned to my old friend VBA, and started to tinker. Below you’ll find the result of that tinkering; a formula which exists on the worksheet to control the min and max values of a chart axis. Link that formula to a cell and suddenly it is possible to set the chart axis based on a cell value. Hopefully, by the end of this post, you too can share in the automatic cell linked bliss I now experience. If you’re not familiar with VBA, don’t worry, I’ll talk you through it step-by-step.. I think I managed to achieve this. 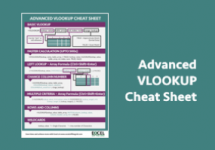 User Defined Functions (UDFs for short) are just like normal Excel functions, such as VLOOKUP or SUM, but they have been created using VBA. UDF’s are intended to be custom worksheet functions to calculate a cell value. Whether on purpose or by accident, Microsoft have made it possible to control various objects with UDFs. For example, it is possible to change a worksheet’s tab color, or to change a chart title (next week’s post). 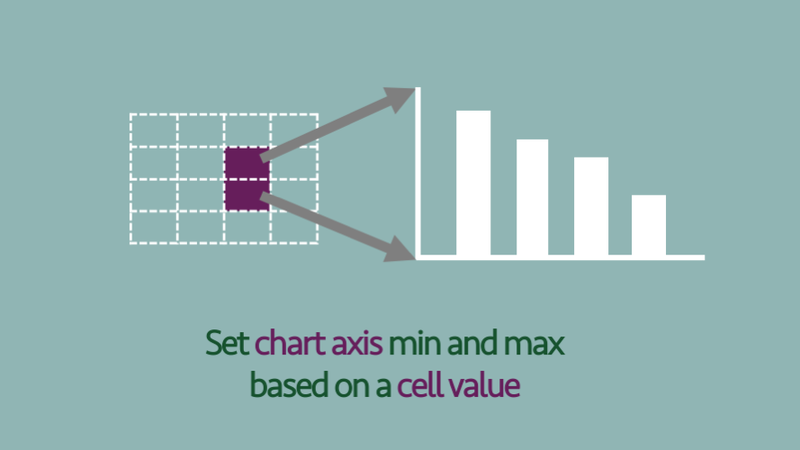 Thankfully, the minimum and maximum values of the chart axis are controllable using a UDF. Horray! The animated gif below shows the solution in action. The values in the cell are automatically applied to the chart. Whether these values are typed in the cell or created using formulas, they will update the chart. To create the UDF click Developer -> Visual Basic (or shortcut ALT + F11). Follow these instructions if the Developer Tab is not visible. Add the code below to the Module as shown. The code for UDFs must be within a standard module to work. Here is the VBA code to copy into the Module. 'If is text always display "Auto"
If IsNumeric(Value) Then valueAsText = Value Else valueAsText = "Auto"
That’s all we need to do to create the UDF, now it’s ready to use. 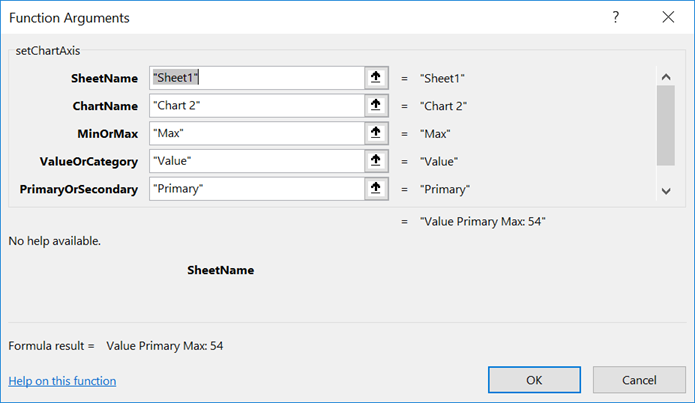 sheetName = the name of the worksheet which contains the chart. chartName = the name of the chart as a text string, or a cell reference to a text string. If you’re not sure of a chart’s name, click on the chart and look at the NameBox (the box to the left of the formula bar). MinOrMax = a text string of “Min” or “Max” to select whether the function will control the Minimum or Maximum axis value. PrimaryOrSecondary = a text string of “Primary” or “Secondary” to indicate which axis to adjust. Value = a number, or a text string. A number will adjust the axis to that value, “Auto” will reset the axis to Automatic. For the function the work, the chart must be in the same workbook as the function. Start typing the UDF then press Ctrl + Shift + A after typing the first bracket, the arguments will appear. Click on the fx button in the formula bar. 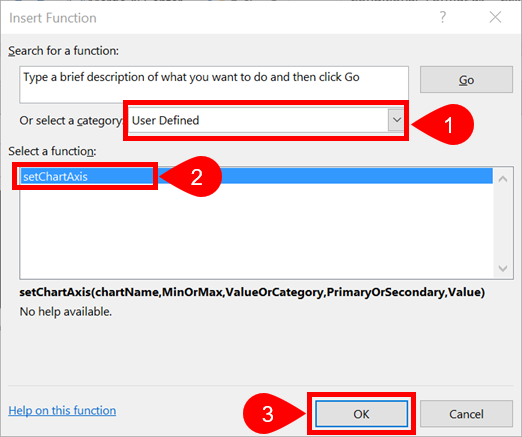 In the Insert Function window select the function under the User Defined list, then click OK. The Function Arguments window will show the order and names of the arguments. If you decide to revert back to Excel’s automatic axis calculation, that is no problem. Any non-numeric value entered as the Value (or in the cell reference linked to the value) will cause the chart to be reset to automatic. Sometimes it is easier to understand by seeing the UDF in action. Save the workbook as an Excel Add-in (.xlam file type). Install the Add-in you have created by following these instructions. The function is now available in all your workbooks. If others open the workbook they will be able to see the function, but it will not work. If you want other users to use the function save it in each individual file. When I try the formula with “Secondary” for PrimaryOrSecondary, I’m getting a #VALUE error. The #VALUE! error occurs if there is any error at all, so it could be any number of things. The most likely reason is that the chart doesn’t have series with a secondary axis. 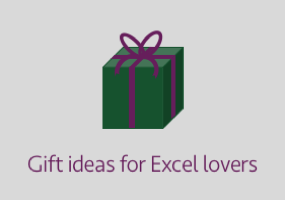 It didn’t work when I tried it in the Excel spreadsheet that you have attached as well. I may be missing something, I’m not sure what. I’ll send you the file with the Secondary Axis set-up so you can see how it works. Thank you for this, it has really helped me! I’m experiencing this problem as well. Would you mind sending me this file too? I am experiencing the same issues as Divya. Could you possibly forward the file mentioned above to me as well? I have updated the file in the post to show how to use all axis. So if you download the file (see the link in the post) you should be able to see how it works. Using the fx for help by filling in, it looks that the syntax is a little different. this is a super cool function! Many thanks for setting it up and sharing it… Once you see the code it does not even look that complicated (when it is already there 😉 ). I was wondering if the script could be adapted to also change the units of the graph (stepsize). Any idea what name should be used to refer to the attribute of the major units ? Many thanks anyhow, this really helps me. Then to refer to it in the formula, use “Unit” instead of “Value” and use either “Major” or “Minor” instead of “Min” or “Max”. Hopefully that’s enough for you to get it working. This is amazing stuff! thank you so much. I was wondering if you could also make the X axis based on min and max. In your example you have Jan, Feb etc but what if the months were numbers 1 for Jan, 2 for Feb etc (this is my case) and then you want to plot only from Feb to June. Let me know if that is possible. Thanks again! (1) Right click on the X Axis and click Format Axis… from the menu. (3) In the formula set the ValueOrCategory argument to be “Category”. If the axis labels are text, Excel will assume the first data point will be 1, the second data point will be 2 and so on. So you can still use month names, rather than month numbers. Hello. Thank you so much for your quick response. The Y axis works perfectly but it seems like the function does not work on the X axis, I keep getting a #VALUE error. My graph has 3 sets of data represented with a line and stacked bars. Could that be the problem? It definiely works. I’ll send you a file with it working. You might have been confused by the typo in my last comment. It needs to be a “Date axis”. great code works perfect if I don’t protect sheets but I would like to protect all sheet is there any work around for this please? This worked beautifully for me. Can I piggyback on this code and make a straight horizontal line at a defined value? Using the series method seems to interrupt the code and caused other issues for me. I would have thought that having a separate chart series would be your best option. As chart values can already be linked to cells, it would be straight forward to update dynamically. I can get the line to work and the vba code to work but separately. When I use together the graph displays only one date and no graph on the x axis. The Y axis still functions normally. I looked into the axis information and it now has a bound function that does not work with current coding. How can I adjust bound using vba? I’m glad you got it working. Apologies for the late response, I had some time off over the holidays. This function is great. I have a scatter plot with an X and a Y axis. How would I change the code to work on the X-axis as well? In the Category argument of the function use “X” or “Y” for a scatter plot. Result: excel crashes. It does not crash anymore when you delete the module from the file. That’s really useful testing, thank you for letting me know. I think I’ve been able to identify the problem. The code uses “Application.Volatile”, which forces the formula to recalculate everytime there is a change in the workbook. It’s there to avoid some specific unlikely events. Obviously, crashing when it sorts is bad, especially as sorting and not an unlikely event. So I recommend removing that line of code (which I will also do in my example file). Thank you so much for this, it works perfectly on my copy. I have uploaded it to a shared drive and when someone else opens it they get ERROR in the box. When I troubleshooted this, I found that if I double-clicked to open the text-box and then enter out it seems to refresh and the error goes away. Each person has to re-enable the macros each time it’s opened but this doesn’t seem to change the error. Are the charts and the code in the same workbooks? If so I’m not sure why it would be causing problems. This isn’t exactly a Microsoft supported solution, so there are lots of aspects which we’re still learning about. They were in the same sheet but I had hidden them behind the chart. I’ve now moved the formula to just below and made the text white and it seems to work fine. No idea why that’s made a difference but i haven’t had that fault since! Please can you send the file to me, then I can investigate the issue. The issue is mixing up the Value and Category axis. On the 2nd sheet you need to use “Category” in place of “Value”. I am trying to use this on a line chart. I have 3 sets of data that are decreasing at a different rate over time. My Y axis is a value in hours remaining. My X Axis is a date range. I am able to use the formula to control the Y axis to be set between min 0 and Max based on the maximum stating value compared to my three sets. When I try to use it to change the X axis between my start date and my end date i either get #value! or it makes my x axis disappear in my chart. what do you think? My guess is that the date axis or the value is text formatted. Have you set the X axis as a Date Axis in the Axis Options? Hi! This code is displaying the “Value primary max” cell correctly, but it does nothing to edit my chart. any ideas? Maybe if I could see the file, I might be able to help. Hi this is great code – however one thing i’ve noticed is that in automatic calculation, the undo function becomes unavailable. I suspect because the function is constantly calculating? Unfortunately, any time VBA code is run in Excel it clears the undo stack. It will also have the same effect when user defined functions are recalculated. It’s just the way Excel is built. Very helpful formula! Question, how would the formula differ for a chart with both a Primary Y axis and Secondary Y axis? I can’t seem to get this UDF to work without a #VALUE! error when the chart is a standalone. When the chart is moved to a created sheet1 for example, I can then name the chart and it works appropriately. When the chart is moved to a standalone sheet, the formula no longer works. I have this code partially working. but it keeps displaying me “Category primary Min: Auto”, instead of the cell which I am referencing it. I am trying to modify the X-axis with dates of start and end period. any idea what is the problem? Hi Julio – My best guess is that the dates are formatted as text, rather than as numbers/dates.